, was born at Birsall in Yorkshire, about 1579; and educated at St. John’s college in Cambridge, where he took both his degrees in arts. He wa* afterwards incorporated M. A. at Oxford, and took the degree of B. D. He first was tutor to the sons of lord Carey of Lepington (created in 1625 earl of Monmouth), and afterwards, probably by his lordship’s interest, clerk of the closet to prince Henry; and after his death to prince Charles, whom he was appointed to attend into Spain in 1623; but, for reasons unknown, was set aside after part of his goods were shipped, and upon that prince' succession to the crown was removed from being his clerk of the closet. Burton, highly disgusted at this treatment, took every opportunity of expressing his resentment, particularly by railing against the bishops. The text they were preached upon was Proverbs xxiv. 21, 22. In these two sermons, and in his apology, he charged the bishops with dangerous plots to change the orthodox religion established in England, and to bring in Romish superstition in the room of it; and blamed them for introducing several innovations into divine worship, The chief he mentioned were, that in the epistle the Sunday before Easter, they had put out “In,” and made it “At the name of Jesus;” which alteration was directly against the act of parliament. That two places were changed in the prayers set forth for the 5th of November; namely, “Root out that Babylonish and antichristian sect, which say, &c.” is thus altered “Root out that Babylonish and antichristian sect of them which say.” Next, “Cut off those workers of iniquity whose religion is rebellion, &c.” was, in the book printed in 1635, thus altered: “Cut off those workers of iniquity, who turn religion into rebellion.”—That the prayers for the navy are left out of the late book for the fast.—That the placing the communion-table altarwise, at the upper end of the chancel, was done to advauce and usher in popery. That the second service, as dainties, was said there.— That bowing towards the altar, wa worshiping the table, &c.
Their counsel refused to sign their answer, for fear of offending the starchamber. The defendants therefore petitioned the court, that according to ancient precedents, they might sign their answers with their ewn hands; declaring, they would abide by the censure of the court, if they did not make good what was contained therein. But this was refused by the court, Burton’s answer was at length signed by Holt, a bencher of Gray’s-inn; who afterwards withdrew his hand, because the other counsel, out of fear, would not subscribe it. However, Burton tendered it to the court, desiring it might be accepted, or Holt ordered to new sign it. The court ordered, that it might be received under the hand of Holt alone, which was accordingly done. 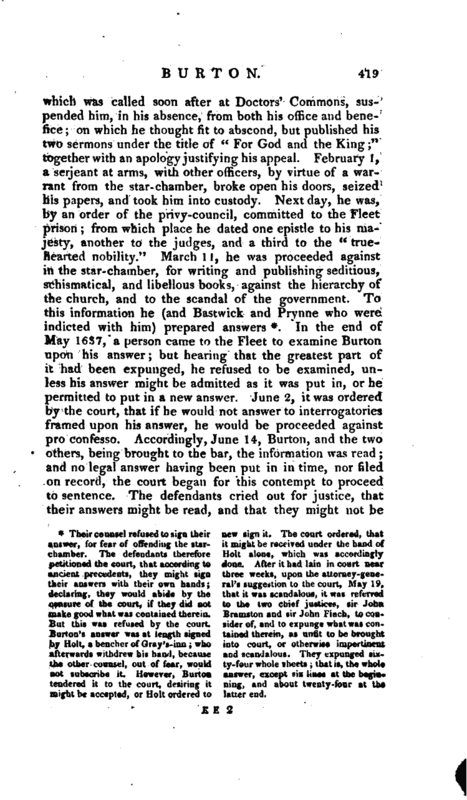 After it had lain in court near three weeks, upon the attorney-general’s suggestion to the court, May 19, that it was scandalous, it was referred to the two chief justices, sir John Bramston and sir John Finch, to consider of, and to expunge what was contained therein, as unfit to be brought into court, or otherwise impertinent and scandalous. They expunged sixty-four whole sheets; that is, the whole answer, except six lines at the beginning, and about twenty-four at the latter end. | condemned unheard, but because their answers were not filed on record, the court proceeded to pass sentence: which was, that Burton, Prynne, and Bastwick pay a fine of 50OO/. 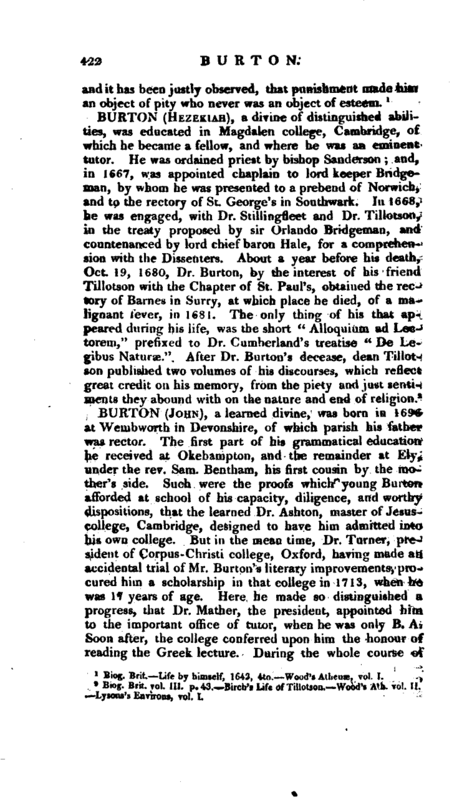 each, and that Burton in particular be deprived of his ecclesiastical benefice, degraded from his ministerial function and degrees in the university, be set on the pillory, have both his ears cut off there, confined to perpetual close imprisonment in Lancaster-castle, debarred the access of his wife or any other except his keeper, and denied the use of pen, ink, and paper: all which, except the fine and the solitary part of the confinement, was executed accordingly, and the cutting off his ears with circumstances of great cruelty, they being pared so close, that the temporal artery was cut. During his twelve weeks imprisonment in the common gaol at Lancaster, great crowds pitying his misfortunes resorted to him, and some of his papers being dispersed in London, he was removed, by an order of council, to Cornet-castle in the isle of Guernsey, October 1637, where he was shut up almost three years; till in November 1640, the house of, commons, upon his wife’s petition, complaining of the severity of his sentence, ordered that he should be brought to the parliament in safe custody. Burton, on his arrival at London, presented a petition to the house of commons, setting forth his sufferings, and there was now a house of commons willing enough to listen to more trifling complaints. In consequence of this, the house resolved that the sentence against him was illegal, and ought to be reversed; that he be freed from the fine of 5000l. 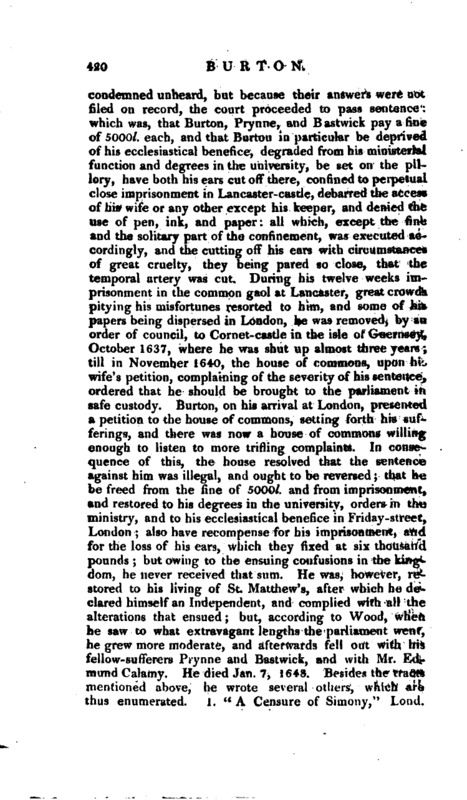 and from imprisonment, and restored to his degrees in the university, orders in the ministry, and to his ecclesiastical benefice in Friday-street, London; also have recompense for his imprisonment, and for the loss of his ears, which they fixed at six thousand pounds; but owing to the ensuing confusions in the kingdom, he never received that sum. He was, however, restored to his living of St. Matthew’s, after which he declared himself an Independent, and complied with all the alterations that ensued; but, according to Wood, when he saw to what extravagant lengths the parliament went, he grew more moderate, and afterwards fell out with his fellow-sufferers Prynne and Bastwick, and with Mr. Edmund Calamy. He died Jan. 7, 1648. Besides the tracts mentioned above, he wrote several others, which are thus enumerated. 1. “A Censure of Simony,” Loud. | 1624. 2. “A Plea to an Appeal, traversed Dialoguewise,” Lond. 1626. 3. 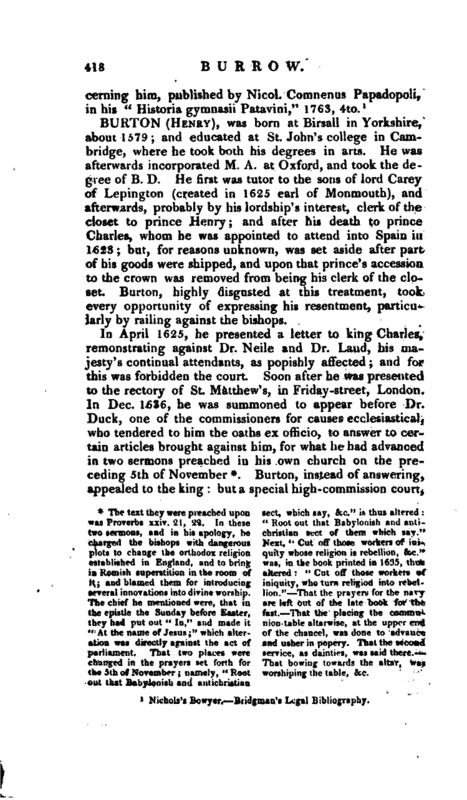 “The baiting of the Pope’s Bull,” Lond. 1627. 4. “A Tryal of private Devotions, or a Dyal for the Hours of Prayer,” Lond. 1628. 5. “Israel’s Fast; or, Meditations on the 7th Chapter of Joshua,” Lond. 1628. 6. “Seven Vials, or an Exposition on the loth and 16th Chapters of the Revelations,” Lond. 1628. 7. “Babel no Bethel; i. e. The Church of Rome no true visible Church of Christ, being an Answer to Hugh Cholmeley’s Challenge, and Robert Butterfield’s Maschil.” 8. “Truth’s Triumph over Trent, or the great Gulph between Sion and Babylon,” Lond. 1629. 9. “The Law and the Gospel reconciled against the Antinomians,” Lond. 1631^ 4to. 10. 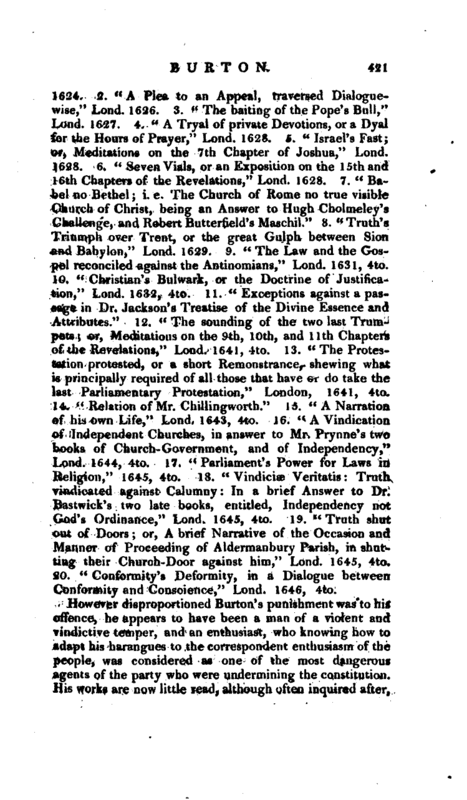 “Christian’s Bulwark, or the Doctrine of Justification,” Lond. 1632, 4to. 11. “Exceptions against a passage in Dr. Jackson’s Treatise of the Divine Essence and Attributes.” 12. “The sounding of the two last Trumpets; or, Meditations on the 9th, 10th, and llth Chapters of the Revelations,” Lond. 1641, 4to. 13. “The Protestation protested, or a short Remonstrance, shewing what is principally required of all those that have or do take the last Parliamentary Protestation,” London, 1641, 4to. 14. “Relation of Mr. Chillingworth.” 15. “A Narration of his own Life,” Lond. 1643, 4to. J6. “A Vindication of Independent Churches, in answer to Mr. Prynne’s two books of Church-Government, and of Independency,” Lond. 1644, 4to. 17. “Parliament’s Power for Laws in Religion,” 1645, 4to. 18. “Vindiciae Veritatis: Truth vindicated against Calumny: In a brief Answer to Dr. Bastwick’s two late books, entitled, Independency not God’s Ordinance,” Lond. 1645, 4to. 19. “Truth shut out of Doors; or, A brief Narrative of the Occasion and Manner of Proceeding of Aldermanbury Parish, in shutting their Church-Door against him,” Lond. 1645, 4to. 20. “Conformity’s Deformity, in a Dialogue between Conformity and Conscience,” Lond. 1646, 4to. Biog. Brit.—Life by himself, 1643, 4to.—Wood’s Athenae, vol. I.